Suggest is a list of options for input controls that aids form filling by suggesting the necessary value on the base of already typed text. It is based on Webix list component. text editor within a component item. combo and richselect component editors. when you type something into an HTML input or Webix text and combo control. 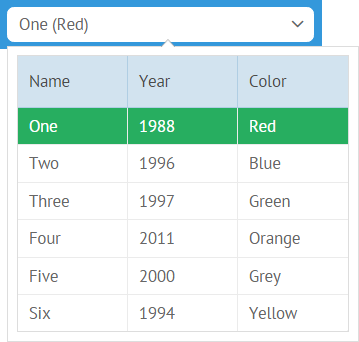 When suggest list is combined with text control (editor) or HTML input its values are automatically filtered according to the letters you have already typed. You can select an item from the list to fill the input or ignore the suggest list and type you own text. When suggest list is combined with combo control (editor) its values are automatically filtered according to the letters you have already typed. You can either select an option from the list or type the text to match any of the options. You cannot ignore the suggest list and enter you own text. When suggest list is combined with richselect control (editor) a popup appears the moment you click its non-editable input. You must obligatory choose some value from the list. Default timeout between key pressing and filtering equals to 1 ms, still it can be modified by the dedicated property. Note that you must select any value from a suggest list, since it's required by combo and richselect nature. 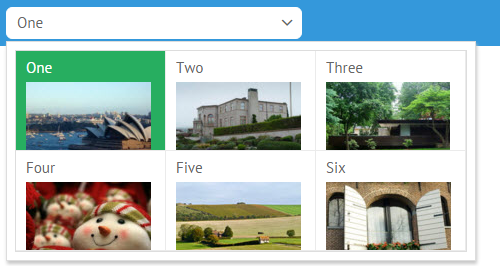 On the client side the list with suggestions can be stored in any of supported formats. It may be put directly into data property (as shown above) or in a variable declared beforehand. At the same time, data can come from the server side. All you need is to specify the script file that will get the data from the database. Suggest list is connected with an input field by suggest property included into the text constructor. Component editors duplicate editing controls yet they are initialized within the component body. provide handlers for edit events. Suggest list can as well be attached to combo and richselect editors, yet then it loses its status of 'adviser' and selection from it becomes compulsory. Suggest list allows defining lots of custom settings in case of a long initialization pattern. List settings include typical list properties. Note that an suggest list configuration can be set via either suggest or options property for richselect, combo, multiselect and multicombo controls. Where can the customization be useful? Suggest list is tuned to show maximum 10 items at a time. If there are more items, a scrollbar appears. If there are fewer item in the list, its height shrinks. DateRangeSuggest - a suggest control based on Webix DateRangePicker. MultiSuggest control is used in the multiselect component editor. If needed, it can substitute CheckSuggest for the above-mentioned use cases. See Advanced Configuration of Popup Selectors for details. 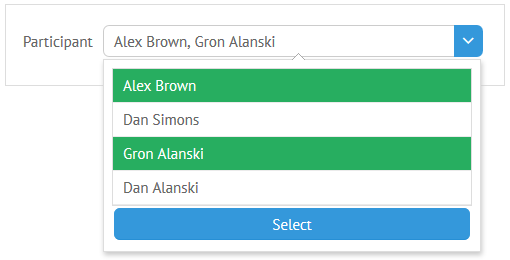 GridSuggest can be used with form controls as well as with component editors. More about its configuration can be found in the related article. 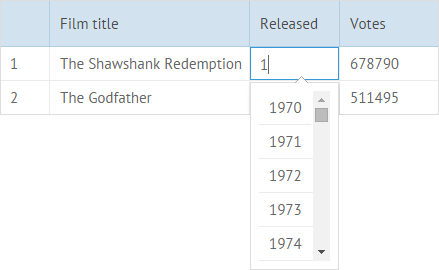 DataSuggest can be used with form controls as well as with component editors. More about its configuration can be found in the related article. 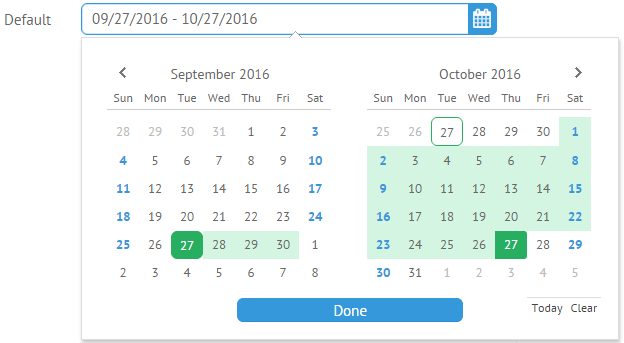 DateRangeSuggest control is used in the DateRangePicker widget. More details are given in the related section.